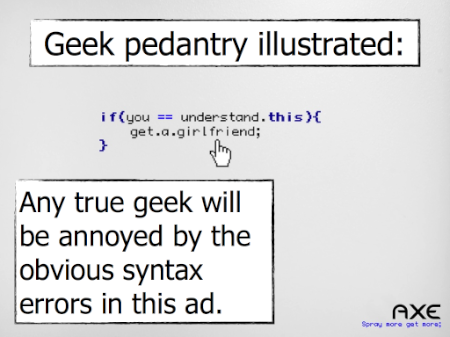 My level of empathy was higher than average when I read Danah Boyd’s post-mortem on her Web 2.0 talk today. It’s amazing how easily things can start to go sideways when just a few of the inputs shove you out of your comfort zone. For a reminder of my own public speaking misadventures, check out my posts on Ignite Raleigh. If there’s one thing I’m very glad of, it’s that there wasn’t a live stream of Twitter chatter being displayed behind my head during the talk. And also that I only had to stand there for five minutes. Nobody knows what you were going to say but you. There’s no point in stressing over the things you didn’t say or the things you changed up. As far as the audience knows, your talk is being delivered exactly as it was written. Unless there’s extreme disharmony with your slides, as long as what you’re saying makes sense, you’re fine. The only thing you should be thinking about is the next thing you’re going to say. I ran into the most problems because I got inside my own head, thinking about what I’d already said, what I hadn’t said, and so forth. I was reworking the speech mentally while I was on stage, and it prevented me from delivering the speech I had already prepared smoothly. I think that to deliver a talk effectively, you need to focus only on making sure you get the next sentence correct. I think that’s especially important for inexperienced speakers. When Tiger Woods plays golf, he can take the wind speed into account, worry about where he wants the ball to land on the green, and figure out what kind of spin he wants to impart on the ball. Weekend golfers need to aim for the middle of the fairway and concentrate on making sure their swing is right. It’s the same with public speaking. If you’re not already an expert, just get up there and deliver the text. Externalize what you’re feeling. I would have done infinitely better had I simply said a bit about what was going on at any given moment. Just saying, “I need to take a quick breath here,” or “Oops, I just skipped that slide,” or anything else about what was actually going on would have been funny, and have lowered the barrier between me and the audience. If things get ragged, just make a joke and move on. Had I remembered to do that, I think I could have kept the speech on track. You need insurance. The other thing I learned is that unless you are a master public speaker, you need backup. I had my speech down pat without notes, so I didn’t bring any with me. My slides didn’t have any of the text I wanted to deliver on them, so they didn’t provide a lifeline when things started to go sideways. My mistake there was underestimating the effects of nervousness. It’s better to grab your notes and collect yourself a bit than to struggle to deliver your speech as memorized without any help. I’m not sure whether I would have put more “notes” on the slides or would have just brought note cards, but one of the two would have been really helpful. I think those lessons might help anybody who’s doing public speaking. I also have some tips for people who are going to be speaking at an Ignite event. Don’t put much text on your slides. 15 seconds is not very long for a slide to be on the screen. Make it bold. This is something I think I got right. Use the whole slide. We were given a presentation template that included the Ignite logo, but were told we only had to use it for the first slide. The presentations that dumped the template after the first slide uniformly looked better than those that kept it. Ignite is much more difficult than a regular public speaking gig. It may seem easy because it’s only five minutes, but it’s not. It’s hard to overestimate the impact of the slides advancing automatically. I practiced in Ignite format many times, and the moving slides still distracted me at show time. Speaking on the same night with so many other speakers adds stress. Figuring out how to deliver an interesting and useful talk in only five minutes is a real challenge. Be prepared to manage the content of your speech as you go along. Another thing I think I did right in preparing was knowing which points I wanted to make and then figuring out how to deliver them using more or less time based on how the speech went. Working to a very specific time limit means you need to be ready to stretch or condense in real time. Duplicate the actual conditions of Ignite when practicing. You want to practice with your slide show running exactly as it will during the presentation. I had trouble figuring out how to make Keynote do that, so I typed up instructions for people who may run into the same problem. There are a bunch of other resources for people who are going to speak at Ignite. Scott Berkun gave an Ignite talk on speaking at Ignite that’s a must-watch. The only bad thing about it is that it’s a bit intimidating. Berkun is a great speaker and his slides are incredible. Jason Grigsby’s advice for Ignite speakers is worth reading as well. Also, there are a ton of Ignite talks available online, for some of the best of them, check out the Ignite Show. Watching other Ignite speakers can be a bit intimidating, but is very helpful in understanding what works well in the Ignite format. Finally, you should go to an Ignite event. I think I would do a much better job the second time, having been there before. The main thing I learned from Ignite is that public speaking is really hard. I guess I already knew that, but the experience was a reminder of just how hard it is. I think had I better understood the difficulty, I would have tempered my ambition a bit and given myself a better chance to succeed. That said, it was a really great experience and I’d do it again, although maybe not in a heartbeat. Update: Wendy Sibley, who gave a killer presentation at Ignite Raleigh, posted her own tips for speakers. Anyway, here’s how you do it. 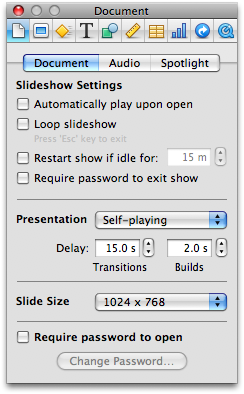 To make your slide show advance every 15 seconds, just click on Presentation and choose “Self-playing,” and then set the delay to 15 seconds. You’re all set to practice for Ignite, just make 20 slides. If you want a slide to be displayed for some multiple of 15 seconds, just copy the slide and add it again as a duplicate. 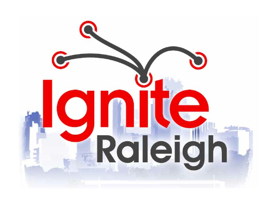 This is Part II in my series of posts about Ignite Raleigh. Part I, which covered preparation, is here. First let me say that Ignite Raleigh was really fun — the speakers were great, the event was incredibly well run, and the crowd was awesome. I don’t think the event could have gone off any better than it did. I was presenter number twelve. I was scheduled to speak at around 8:30, and I got there around 5:30. The speakers milled around for awhile, then we got the rundown on how things were going to work. I was in the third set of speakers, and was told to go backstage during the second intermission and wait for my turn. One small hitch was that the screen was at the front of the stage, so it was impossible to look at what was on the screen and at the crowd at the same time. One of the great things about Ignite is that it’s a huge sensory overload, there’s music, there are talks, there’s the emcee, and on and on. After the second speaker I wished I could go next. I was really, really nervous and the wait was interminable, or so it seemed. I now understand why performers tend to chill out in the green room until they take the stage. With every speech I felt like I forgot a little bit more of my talk. When I was backstage right before I went out, I came up with a new joke to open with, and I was excited about that. Here’s the thing. For days, I had my introduction down cold. It was good and I was comfortable with it. So I get up on stage, nervous as all get out, and I skipped a couple of sentences of it — the ones that really laid out what I was going to talk about. As I continued to speak, I looked up at the slides and realized I’d skipped something. Then I started thinking about whether I could put that stuff back in or whether I should just forget about it it. I soon reached the spot in my presentation where I was going to read one of the slides. Unfortunately, the slide I was supposed to read wasn’t going to show up for another 20 or 30 seconds. At this point I had to make a decision. When you’re doing a 5 minute presentation with slides that advance automatically, you really don’t want to be making decisions. Fortunately, I had the text I wanted to read on a card, so I just read it from there. But I was way, way too deep inside my own head at that point. I was thinking about what I hadn’t said, what I wanted to say next, whether the missing sentences would hurt the rest of the presentation. Oh, and a few hundred people in the audience were waiting for me to say something. Here’s where it gets kind of blurry. The slides were moving past. I was saying things. I was looking at people in the audience who seemed concerned for my well being. One guy actually said what was on the current slide — I actually chuckled a bit internally at that. That slide had nothing to do with what I wanted to say right then. But I appreciated the sentiment even as I was horrified by it. I was extremely frustrated with myself. My frustration was showing. We’ll call that the low point. I had just missed the opportunity to tell the best joke in my presentation. I had switched two of the sections. My fight or flight response had kicked in, and I was really thinking now might be a good time to leave. Unfortunately, I wasn’t finished. Then something happened. A slide I’d made that was sort of a standalone joke got some laughs. Honestly, I didn’t know if anyone other than me would think it was funny when I made it, but people did laugh and that was a huge help. The fact that anything was going over well in the middle of what very much seemed to me to be an escalating catastrophe was a positive thing, although that didn’t occur to me at the time. Anyway, I told myself that there was nothing to do but finish this thing, and I managed to make my last point and get to my conclusion, which I botched a little but survived. I finished a little early, made a joke about finishing early, and got out while the getting was good. That about covers it. I’ve also written up what I learned from the experience, if you’re interested. Last night I gave a talk at Ignite Raleigh. Public speaking is not something I’m particularly comfortable with, but I thought I’d give a shot. I’m writing up a few blog posts to go back and read next time I have a public speaking gig, and that might help other Ignite presenters as well. First, a word about the Ignite format. Ignite features a number of speakers, all of whom are given five minutes to speak. They also prepare a slide show of 20 slides, which advance automatically every 15 seconds. When you’re slide show’s over, you’re done. Last night we had 15 speakers, and none went over. So the key challenge is being able to tailor your speech to come as close as possible to the 5 minutes you’re given, without going over. The secondary challenge is making slides that assist you in giving a good talk — without overwhelming or distracting you. For the first week after I agreed to participate, I bounced around ideas for speaking topics. I came up with and abandoned four or five ideas before settling on my final topic, which was the robustness principle. I was very happy with the topic I chose. I sat down Saturday morning and wrote out my full talk, and then read it aloud to my wife. It was boring. Really boring. It read like a Wikipedia article. However, it did outline exactly what I wanted to talk about. So I sat back down and rewrote the whole thing. But first, I needed to figure out how long the speech should be in terms of word count, which is how writers tend to think. After a little research, I saw that the consensus on the Internet seemed to be that you should speak at a pace of roughly 100 words per minute, so I shot for a 500 word talk. The second draft was much, much better than the first. I trimmed out a lot of the trivia that didn’t contribute directly to my point, and I rearranged it to make sure it would grab people at the beginning and help them understand what, exactly, they were going to learn. I read the second draft to my wife, and she liked it much better. Unfortunately, when I read it aloud, it only took me about two and a half of three minutes. So then I went back and added some stuff back in. At that point, the bones of my speech were there. I knew what I wanted to say. What I didn’t know was how best to create the set myself up to give a good speech. I knew I wasn’t going to walk up on stage with the full text of the speech in hand. If you do that, you wind up reading the speech and it sounds awful. I wound up giving the speech without notes, about which more later. At that time, I assumed I’d trim down the speech to a list of terse notes that I could refer to. I wrote the speech on Saturday and started working on my slides on Sunday, because they had a Monday due date. Here’s another thing I didn’t know: making a decent presentation takes forever. I made some slides on Sunday, but I found it tough to getting inspired. I think I finished about five slides that day, and I also practiced my speech a few times. Monday was slides day. I decided that the best approach was to create slides that provided supplemental information about what I was talking about, as opposed to driving the presentation. In some areas I was talking about things that were on the slides, but in many others the slides had little to do with what I might be saying at that moment. Because I didn’t know if I’d be able to practice in the Ignite format, I didn’t want to have to worry about my talk falling apart if I got out of sync with the slides. By about midnight on Monday I had finished the presentation and emailed it in. I didn’t think that the slides were great, and they outperformed my expectations when I gave the talk. The audience reacted positively to the slides, and one slide I put in as a joke did get laughs without any support from me. That was a positive. Once I’d emailed in the slides, I practiced a few more times before bed. I also pared down my presentation til it was just notes. At one point, I added back in the specific phrases I wanted to use when I moved from one point of the talk to the next, but in the end I tossed out the notes completely. It occurred to me on Tuesday, the day before the show, that if I couldn’t practice in more realistic conditions, I was doomed. I still hadn’t figured out how to automatically advance slides in Keynote. After putting in more research, I finally figured it out, and so Tuesday night I was able to hook the laptop up to my TV and give the speech while watching the slide show. After getting things rigged up, I practiced the speech a bunch of times with the slides, and got it down pretty well. When I started practicing with the timed slides, I wished I could restructure the presentation a bit, but it was already too late. So I just accepted the presentation as it was as a constraint and tried to work within it. My main worry was that I’d left only 45 seconds (three slides) for my conclusion — so I decided that when the seventeenth slide came up, I’d start on the home stretch either way. At this point, I was speaking from my notes. On Wednesday morning (the day of the show), I practiced my speech in the shower without notes, and felt like I could get by without them. I rehearsed the speech once for my coworkers with notes, and it didn’t go particularly well. I took the afternoon off on Wednesday to do some more rehearsing, and practiced all afternoon without any notes, just going from the presentation, and by the time I was ready to leave for the show, I felt like I had things down pretty well. I had gotten good at managing the time — filling in when I got ahead or cutting things when I got behind — and I had a good relationship with the slides in that I knew what my cues were to move from one topic to the next. I also had the key pieces of the presentation down pat. I had a few sentences and phrases that I knew I wanted to use, and I could employ them with precision. I stopped rehearsing when I felt like I wasn’t getting any better. So I ate a little bit and headed out to the show. The next installment in this series is Show night. You can also skip ahead and read my lessons learned post.